Welcome to the new Americana TV Channel. This is the first in our series of articles that will be accompanied by short films on YouTube. To begin our series, we thought we'd write a tribute to one of our favorite pilots: Jeff Harris. Unfortunately, Jeff passed away prematurely and unexpectedly, but his legacy working with World War II airplanes will never be forgotten. 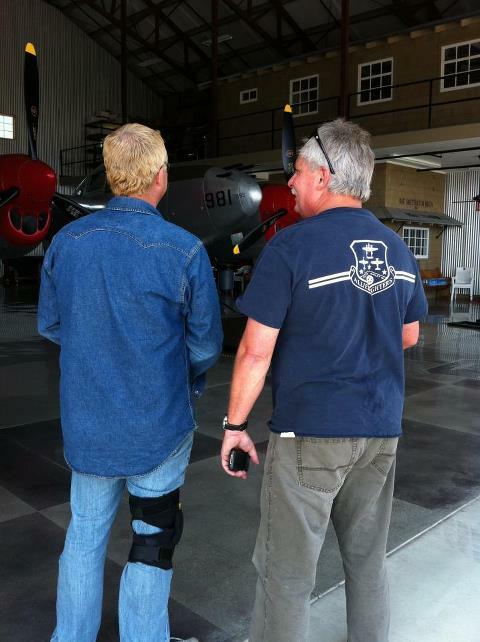 Jeff ran the Allied Fighters hangar at Chino Airport owned by Jack Croul of Behr Paint. The crown jewel of the hangar was the Honey Bunny P-38 Lightning. Jeff often referred to himself as the "lucky lad" who got to fly this aircraft, considered by many to by one of the heroes of World War II. After air shows, people would ask him for his autograph, Jeff would laugh and say the plane should sign the autograph, not him. Jeff's father flew in World War II, and the younger Harris considered it his passion to restore and fly these vintage planes as a sort of living, moving museum - teaching the next generations about the men and machines that won the war. 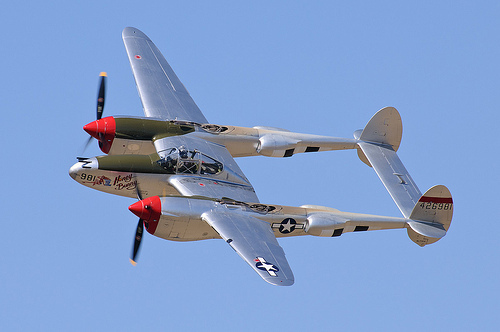 Designed by Clarence "Kelly" Johnson as a high-altitude, twin-engine interceptor, the P-38 was considered the best and most important American combat aircraft of the late 1930s and early 1940s. In 1937, the Army Air Corps approved Lockheed's construction of the prototype XP-38, which was delivered and took first flight in January of 1939. Primarily serving in the Pacific, North Africa, and Europe, the German Luftwaffe called the plane "Der Gabelschwanz Tuefel" or "the fork-tailed devil" for its success in shooting them down. In fact, the Lightning shared credit for the destruction of the first German aircraft by U.S. Army Air Force fighters in 1942. According to the Lockheed website, "The P-38 played a vital role in Allied war efforts, helping to achieve air superiority over Africa in 1942 and 1943, supporting the invasion of Sicily, escorting B-17 and B-24 bombing runs, and bombing Romanian oil refineries. One of the more famous P-38 missions took place on April 18, 1943. In a well planned mission, sixteen P-38s took off from Guadalcanal and intercepted Admiral Isoroku Yamamoto's plane, shooting it down near Shortland Island in the Pacific. By war's end, the P-38 was responsible for downing more Japanese aircraft than any other Allied plane." In 1944, the plane began to be phased out of a combat role and phased into mapping as well as collecting intelligence information. Now collectors vie over the historic aircrafts and spend a great deal of time and money shipping the planes from the founding site, restoring them to museum quality condition, exhibiting them in museums, and flying them in air shows. Jeff and Jack are two such men - bringing the Honey Bunny back to life in celebration of the P-38's contributions to the war effort as well as the contributions of the heroic aviators who flew these planes. Click below to view the short film that celebrates Jeff Harris's life as well as the Honey Bunny itself - we included outtakes, so you could get to know the real Jeff - he would have wanted it that way!